Zdravstvuite tovarishchi! Yesli by... oops! Izvinite, I begin again. 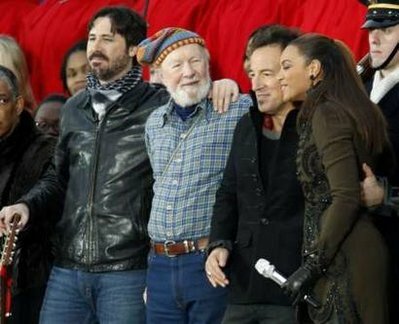 If I had hammer and sickle and dollar for every note that Pete Seeger sung at today's inaugural celebration in honor of Barack Obama, I would have to give most of it back to state! Meanwhile, here picture of American music legend singing with Bruce Springsteen at event that happened today. Apologists note: The One, The Only Barack Obama attended the event, and in 2005 Seeger said "I still call myself a communist"; he'd said similar things in 2000 and 2004 (link). Not that there's anything wrong with that or anything, but I am sure reactionary bourgeois pig folk singers are waiting their invites.. on the way to Sibir! I saw a sign that said "private property"
12/27/11 UPDATE: The original video (Youtube ID Xg0wiOHc9tI) was deleted so I replaced it with another copy. Obama the new Hitler many of us will become the new jew? 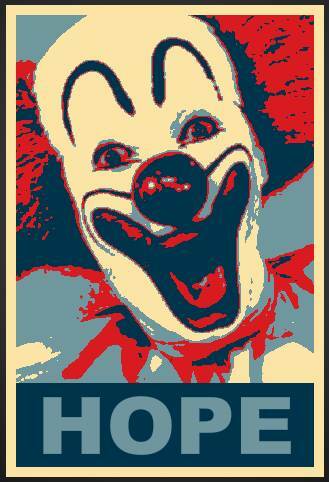 Obama is just the new face of Fascism. It's "Business as Usual" for our corporate masters and their plan for World Government. Quantanimo Bay is closing. Big Deal! What about the hundreds of domestic concentration camps that have been built?